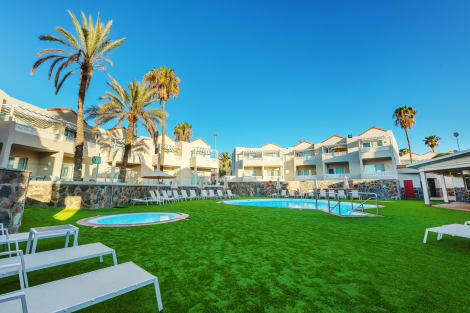 When you stay at Apartamentos Tisalaya Park in San Bartolome de Tirajana, you'll be near the beach, within a 10-minute drive of Yumbo Shopping Center and Maspalomas Lighthouse. This apartment is 12.3 mi (19.8 km) from Amadores Beach and 1.9 mi (3 km) from Maspalomas Golf Course. Bright apartments with terrace or balcony. Also, the complex has eleven swimming pools, a buffet restaurant and a pool bar. Apartamentos Koala Garden THe Home Collection is characterized by a wide range of leisure and activities, so that each member of the family enjoys the holidays as it deserves. For this it has, among others, a gym, sports courts and a games room. Of course, for the little ones the fun is guaranteed in our playground, in the mini club "Koalín" and the mini disco. Undoubtedly, the strategic location of THe Koala Garden Suites Apartments is a key element to complete your holiday on the island. The complex is located close to shopping centers, an amusement park, local market and recreation areas. In addition, the south of Gran Canaria offers as spectacular landscapes as the impressive Dunas de Maspalomas or the kilometric Playa del Inglés. Let yourself be embraced by this unique environment ... you will enjoy an experience in which rest, fun and you are the real protagonists. Featured amenities include express check-out, dry cleaning/laundry services, and a 24-hour front desk. A roundtrip airport shuttle is provided for a surcharge (available 24 hours), and self parking (subject to charges) is available onsite. Make yourself comfortable in this apartment, featuring a kitchen with a full-sized refrigerator/freezer and a stovetop. There's a private balcony. A 32-inch flat-screen television with cable programming provides entertainment, while complimentary wireless Internet access keeps you connected. A private bathroom has a deep soaking tub and a hair dryer. Make yourself at home in one of the 110 guestrooms, featuring kitchenettes. Rooms have private balconies. Wireless Internet access (surcharge) keeps you connected, and satellite programming is available for your entertainment. Conveniences include safes and coffee/tea makers, and housekeeping is provided weekly. With a stay at Maspalomas Lago in San Bartolome de Tirajana, you'll be within a 5-minute drive of Yumbo Shopping Center and Maspalomas Golf Course. This apartment is 2.3 mi (3.7 km) from Maspalomas Lighthouse and 1.8 mi (2.9 km) from Maspalomas Dunes. This delightful complex is located on the outskirts of Campo International, lying just 2.5 km away from the dune beach of Maspalomas. Guests will find themselves just 4 km away from the centre of Playa del Ingles. The hotel lies just 100 metres away from links to the public transport network. This charming complex offers guests a veritable home away from home. The bungalows are beautifully designed, and feature modern amenities for added comfort and convenience. Guests can enjoy a leisurely swim in the pool, as the little ones splash nearby. Guests can enjoy a host of activities, including table tennis, beach volleyball, bocce and billiards. All guests can enjoy the entertainment programme that the hotel has to offer. Exclusively designed for adults, this simple apartment is in Maspalomas. The property features a total of 84 units. Set at the southernmost tip of Gran Canaria is the popular holiday resort of Maspalomas. A favourite with holidaymakers from northern Europe, the town is known for its party atmosphere and nightlife, as well as its upmarket hotels, wide sandy beaches, clean and shallow waters, and excellent climate. 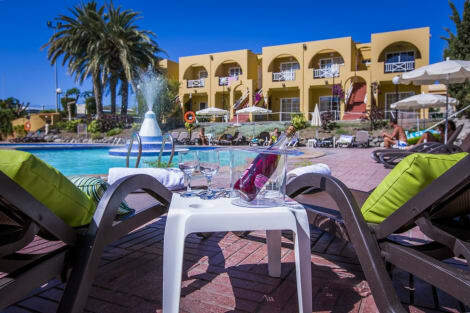 Take a look at our range of Maspalomas hotels, all situated within easy reach of the resort's main attractions. Being a beach resort, it is the stunning coastline that attracts most visitors to Maspalomas. The beautiful sand sweeps around the coast for 17km, making the area a favourite with families as well as sun seekers looking to work on their tan. Maspalomas' sand dunes are one of the area's major features. Further back from the coastline they become a wildlife reserve, where access is restricted to protect the plants and animals. The western end of the reserve has become a popular resting place for many species of migratory birds making the journey between Europe and Africa. Palmitos Park to the north of the resort is a favourite attraction with visitors who go to watch the park's dolphins during the daily shows. Aqualand Maspalomas is the largest water park on the island and if you're looking for thrills and spills in the sun then this is the place to come. The site boasts a huge number of water slides, as well as more relaxing attractions such as the bubble pool and chill-out area. Choose to get involved in a huge range of water sports, from windsurfing and scuba diving through to sailing and parascending. The area between Playa del Inglés and Maspalomas is regarded as a good spot for surfing. If you want to take in Maspalomas' beautiful scenery from the saddle, contact El Salobre Horse Riding to book a place on one of their treks. Golfers will be in their element here thanks to the excellent choice of courses dotted around the local area. Maspalomas Golf offers the chance to play with the area's stunning sand dunes as a backdrop, while Lopesan Meloneras Golf is an 18-hole, par 71 course that has several of its holes situated directly along the coastline. When it comes to eating and drinking, you won't be short of options in Maspalomas. La Palmera Sur specialises in Canarian cuisine with oriental touches, while El Salsete serves traditional Spanish dishes, made using the freshest market ingredients and creatively presented. Samsara, immediately recognisable thanks to the towering Buddha statue in the entrance, is a fantastic choice if you're keen to try some Asian cuisine.